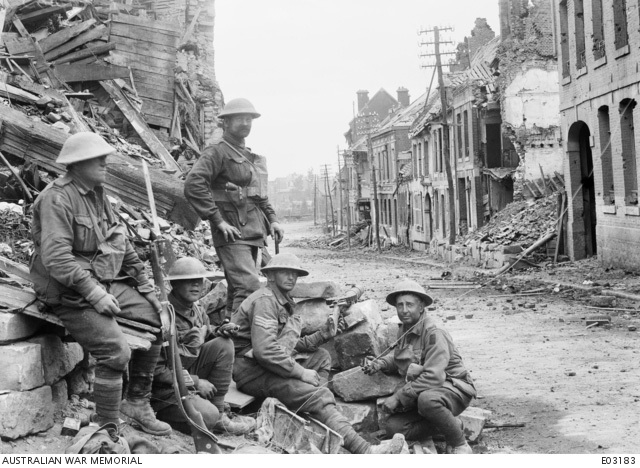 Between June and October 1918, Australian troops fought resolutely along the Western Front in Northern France. Their involvement in battles at Hamel, Amiens, Montbrehain and others made significant contributions to bringing the war to an end. As the world pauses to mark the 100th anniversaries of these battles, discover how our men lived the Anzac spirit during the final months of conflict. Download our commemorative resource, The battles that won the First World War (PDF, 2.38MB). succession of allied victories that historians now refer to as the ‘Hundred Days’ Offensive. 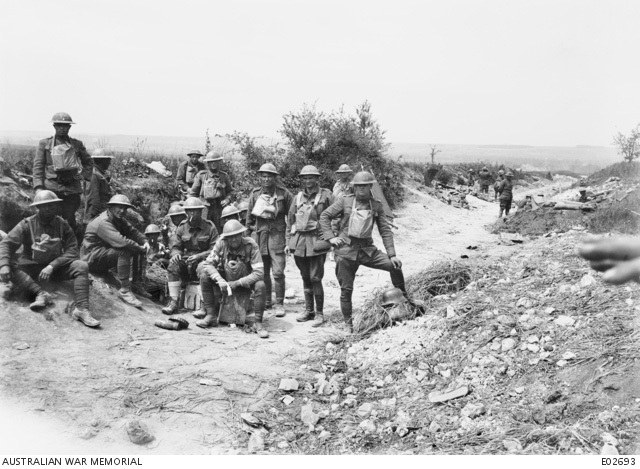 Australian and American troops during the battle of Hamel (Australian War Memorial). Please note: Following publication, consultation with descendants of Private Harry Dalziel determined that Harry did not lose his finger during the Battle of Hamel (although he did suffer a hand injury) and part of the journey from Townsville to Atherton was made via steamer. More information on the life and service of Private Harry Dalziel can be found at www.harrydalzielvc.org. This resource explores Hamel, Amiens and Montbrehain, however there are many more Western Front engagements and aspects to discover related to these final months of the war. The most notable for Australia is The Battle of Mont St Quentin/Péronne on 31 August 1918. This battle is often regarded the Australians’ most brilliant action of 1918. A machine gun position established by the 54th Battalion in Péronne (Australian War Memorial). Australian troops were also involved in the Second Battle of the Somme on 21 August 1918, an attack on the Hindenburg Outpost Line on 18 September 1918 and The Battle of St Quentin Canal on 29 September 1919, in which the allies broke a 10km wide hole in the formidable Hindenburg Line trenches. Other notable battles of the ‘Hundred Days’ Offensive were fought at Saint-Mihiel, Canal du Nord, Montfaucon (the Meuse-Argonne Offensive), Ypres, Cambrai, the Selle River and the River Sambre, however these engagements did not involve Australian troops. Many Australians were also serving in the Middle East at the time, although their contributions are not considered part of the ‘Hundred Days’ Offensive. The Australian Light Horse and others were involved in many engagements, including Nablus, Amman and Damascus. The allied victories during the ‘Hundred Days’ Offensive paved the way for the Armistice. This historic agreement of 11 November 1918 silenced the guns of the Western Front and led to the end of the First World War. News of the Armistice was met with joy and celebration around Queensland and the world. 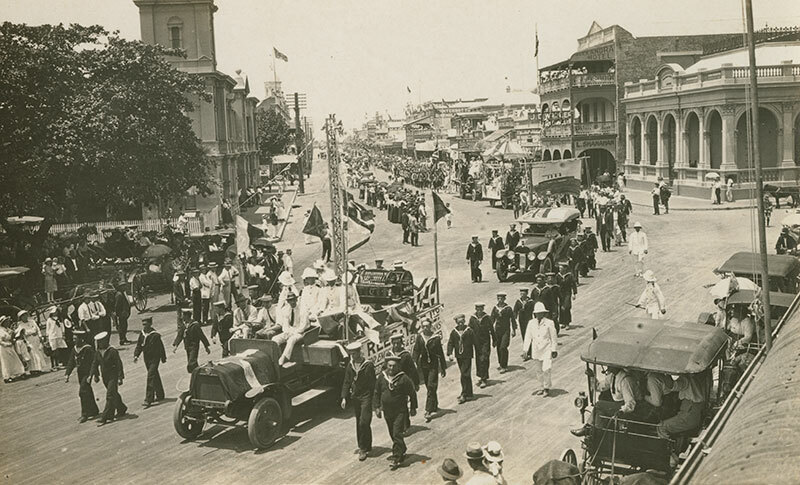 An Armistice Day peace procession through Townsville, 11 November 1918 (John Oxley Library, State Library of Queensland). The anniversary of this momentous event is now a key time of commemoration—Remembrance Day. It’s an important opportunity to reflect on the sacrifice of our selfless servicemen and women. In 2018, Remembrance Day is even more significant as it marks the 100th anniversary of the Armistice. Discover Queensland’s special Armistice Centenary commemorations and the many ways to be involved.